My friend (let’s call her A for amiga) and I have been under orders by various friends, uncles, self-help books, and therapists to relax, let things go, practice being self-indulgent, and do Nothing. We were puzzled by this advice: surely, if we stop being vigilant and relentlessly busy, if we excuse ourselves from our self-imposed servitude to the needs of others for a few days, if we stop trying to do Everything, or at least Something, then all manner of bad things will happen. No? And, logistically, HOW does one do Nothing? Where does one go? We reacted to this advice with concern and doubt. But then I noticed that everyone seems to find time to do Nothing at this time of year. The dance teacher was going on a cruise. Members of my staff were posting pictures online of drinks with umbrellas, served on tropical beaches. Colleagues were off to Costa Rica. Friends at the gym were going to St. Lucia. Uncle D. was going to Florida. The local news magazine had a series on Caribbean getaways. From all of this evidence, I drew a conclusion: when people are oppressed by cold and darkness, and overwhelmed with managing boots, scarves, mittens, and parkas, not to mention their jobs and personal lives—they get on a plane and go somewhere warm. This is what people do, I told A. She was skeptical. But I persisted—people might know something we don’t, I argued. Maybe we’ll like it if we go, too. We fretted, we gave one another encouragement, we asked our friends for permission (Us: “should we take a holiday somewhere warm?” Friends: “Um, sure, why not…?”). We discussed it with our therapists (Therapist: “Whose voice do you hear telling you that taking a vacation is irresponsible or lazy? how can you talk back to that voice?…What’s the worst thing that could happen if you do what you want?…For the love of Pete, just get on the plane!”). We realized that the only way a vacation was going to happen was to rely on an old-fashioned travel agent, in whose hands we could place all the arrangements, and our credit cards, and then pretend we had nothing to do with it all. We found our man (A’s cousin), and he was able to do exactly that. We closed our eyes, gave him our account numbers—and the next thing we knew, we were booked for an all-inclusive resort in the Dominican Republic. The day of our departure, we dressed in layers and packed cleverly, gradually shedding our winter skins during the flight, swapping boots for sandals in the airplane bathroom. When we left the east coast, we were in the middle of a nor-eastern—rain, snow, ice pellets, high winds, cold temperatures. Four hours later, we stepped off the plane into perpetual summer. I felt like a vampire up past her bedtime, as though my mature, pale goth skin was beginning to smolder in the intense late-afternoon sunlight. It felt fantastic. After checking into our hotel room, lathering up with SPF 50+, we headed straight for the water, via the bar, and began what came to be a daily ritual, of walking a couple of miles up and down the beach, barefoot in the warm surf, sipping frozen passion-fruit daiquiris as the tropical sun started to set. Somehow, all our doubts and distress about the perils of doing Nothing started to feel less real, like they belonged to a different version of ourselves. If we’d wanted to, we could have kept ourselves very busy. We could take a 1/2 day party cruise on a pirate ship, eating, dancing, drinking, and snorkelling (presumably drunk the whole time, which struck us as a bad idea). We could go zip-lining or take a tour of Santo Domingo. 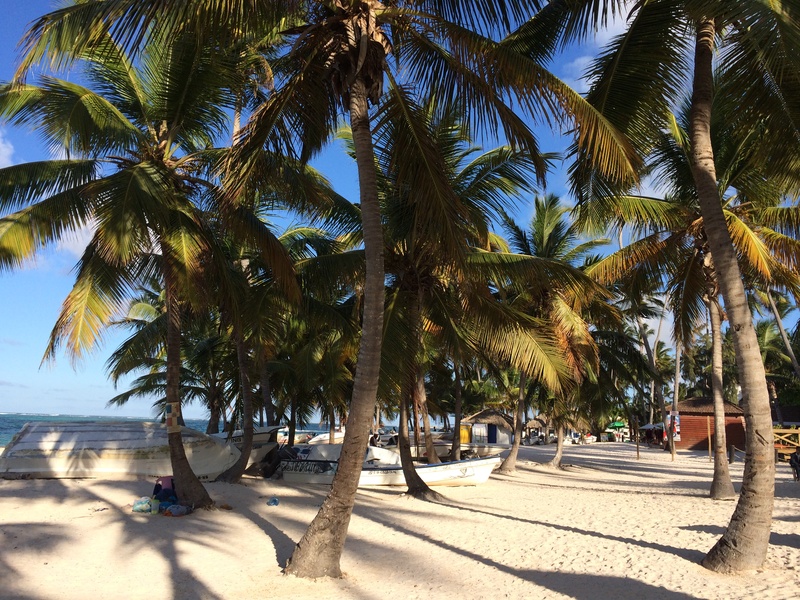 We could take a different (sober) snorkelling tour to the reef, and the freshwater cenotes, with a stop a local school—we were meant, apparently, to enjoy the fish, the manta rays, and the children in equal measure. At the resort itself we could do yoga, archery, and—inevitably—zumba; there were cocktail contests and bachata lessons, beach volleyball games, foam parties in the pool, lounge singers in the courtyard at night, a circus show featuring “Circus Show” (the troupe’s name), and, if we’d stayed longer, a magician and karaoke. I’ve been to a resort like this on my own before, and, being me, ended up feeling anxious and stressed trying to manage all the excursions and activities, trying to do Everything. This time, with the mutual reinforcement of A, we committed to declining just about every diversion available (turns out, after one lesson, and a bit of practice at the nightclub, that I do a decent bachata and merengue; and I can never turn up a chance to watch someone juggle fire). Except for our last day, we never set an alarm; we didn’t carry our phones with us and left the laptops at home; we never turned on the tv. After lingering over our cafe con leche and passion fruit and bacon for breakfast, we’d repair to the beach, and begin a cycle of lounging and reading, swimming, and strolling back and forth to the bar and the bathroom, repeating as needed. Of course, we could also have kept ourselves busy being drunk the whole time. The bars open at 10, with guests ready to go, ordering morning beer and champagne with a mix of adult complacency and adolescent excitement at getting away with something slightly naughty. I suppose it is naughty—very carnivalesque—where people who otherwise put a lot of energy into being responsible adults elsewhere get to step out of those roles as much as they like in a social space set apart from the real world for just this kind of escape. And yet, despite the anonymity of travel, all the privileges we pay for in our vacation package, the advertising that sold us on the trip, which insisted that we can express every facet of our wild, adventurous, “lust for life”—most everyone’s imagination goes no further than: “I can be buzzed all day without straying 100 feet from this beach chair!” Which is not to suggest that A and I didn’t take advantage—we discovered that somewhat weak, frozen, passion fruit daiquiris can be quite refreshing in the mid-afternoon. But–a confession–we only managed a few drinks a day: in addition to the fact that we were so comfortable lounging in the shade that we were disinclined to go back and forth to the bar with the frequency necessary to sustain a basic level of intoxication, we also found ourselves in an odd puritan bind, concerned to get our money’s worth by drinking as much as we could, and yet not having either the self-indulgence, or the hepatic efficiency, to keep up with our fellow-guests. And yes, we will report back to our therapists that the greatest distress we felt on that holiday was prompted by our inability to get, and stay, drunk. And as idle as all that sounds, we could have been more idle still. Speaking for myself, I was proud of how well I took to doing Nothing, and yet, while I was physically at rest, I couldn’t keep my mind from working away at Something. The pace of my thoughts slowed noticeably: interestingly, with another person there with me all day as an audience for any banal notion that crossed my mind (“I wonder what they do with the seaweed they rake up off the beach?…I’m surrounded by food, and yet crave barbecue chips…I’m astonished at what that lady is wearing…Hmm, the sunscreen seems to be eating away at my nail polish…”), I had noticeably fewer thoughts than usual piling up on one another. But I just can’t shut those thoughts off all together—wherever I am, the observation, the analysis, and a certain amount of maintenance worrying/planning runs ceaselessly in the background. I noticed, though, that once returned to my regular life, for the first couple of days at least, the mental traffic did seem much more subdued. It didn’t last, but I’m encouraged that that engine of rumination/noise/ratiocination/traffic/clutter is capable of running a few notches below Max/Critical, with sufficient vacation time (we should have stayed away longer). Maybe A and I stayed more sober than we needed to, maybe we thought a little more than is ever good for us, but we’re smart women, and in pretty short order we figured out how to just give in, and let the resort do its thing. You’d have to be a deeply, stubbornly, unhappy and curmudgeonly person (and I’ve known some, and we’re not) to resist the tranquilizing effect of warm sun, sand, and water during the day, and the equatorial stars and a brilliant full moon lighting up the whole Caribbean sea for you at night; of tropical breezes in the palm trees; of being in an environment, however artificial, specifically engineered to make you feel looked after, sated, and calm. On our last day, we made sure to get up early, to get in one last walk on the beach, one last swim, one last feast on passion fruit, bacon, and mango doughnuts, one last dose of hot sun to last us through what surely has to be the very end of a very long, hard winter. Then we got on the plane, and put all the layers back on—socks, long pants, sweaters, boots, parkas—over top of our rested, sunburned bodies, ready for the descent from Nothing, back to Everything. Reblogged this on Prof's Progress.